High on my list of places I’d travel to if a time machine were available is a recording studio on the west coast in the year 1955. Jimmy Giuffre was playing a short original composition called “So Low.” He played a clarinet, accompanied only by his own tapping foot. Already in his mid-thirties, this three minute recording serves as a perfect entry point into his music, for it is at once both modern and infused with a folk-like timelessness. Giuffre’s work invites a listener in with its small, quiet bearing, but once inside, it’s a complete and remarkable world of its own. On what would have been Giuffre’s 87th birthday, the news reported that he had died two days earlier, on April 24th in Pittsfield, Massachusetts. Jimmy Giuffre was born in Dallas, Texas in 1921 and took up the clarinet when he was nine, followed by the tenor saxophone in his teens. During a four year stint in the Army he played in a quintet entertaining troops in mess halls, after which he moved to Los Angeles. During the forties and fifties he found work as a writer and arranger with Buddy Rich, Jimmy Dorsey, Woody Herman. His best known composition, “Four Brothers,” was written for Herman’s band. With the formation of his trio, The Jimmy Giuffre 3 (he always used the digit rather than the word) in the late fifties, he pioneered a chamber scaled approach to jazz. The drummerless trio boasted Jim Hall on guitar and, for a time, Bob Brookmeyer on trombone, though that spot was also occupied by one of several different bass players. Following his artistic inclinations, by the early sixties he was moving further away from traditional song forms. However, the intimate scale and neighborly volume continued apace, making his endeavors markedly different than those of such contemporaries as the Art Ensemble of Chicago or the Sun Ra Arkestra. My introduction to Jimmy Giuffre’s music came in 1973 when I was living in Philadelphia. Hitchhiking out of the city one day, I received a ride from a guy who was a jazz fan. I learned that he had a brief flurry of notoriety in the sixties when he perfected using Parker pen caps as a means of making music. By the time I was riding in his car he’d pretty much set that aside for a more traditional career and family path, though he would sit in with local bands from time to time. He was knowledgeable about both jazz traditions and more contemporary experimentation, and invited me to call him sometime. He invited me over and played me a range of different recordings, but one in particular spun me around. 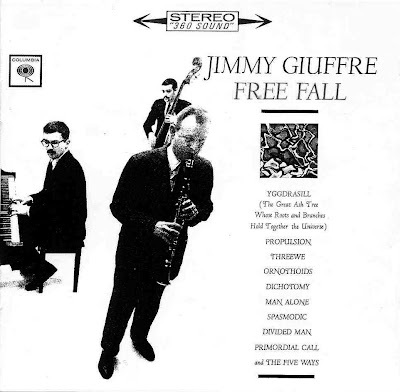 It was Jimmy Giuffre's Free Fall. I was 19, and a fan of such albums as Soft Machine's Third and King Crimson's Lark's Tongue in Aspic. Having neither the repetitive patterns of the former or the more foreboding architecture of the latter, I was in new territory and completely mesmerized. Giuffre’s clarinet was like a bird, and with pianist Paul Bley and bassist Steve Swallow they seemed to have harnessed the natural rhythms and organically elliptical cadences of the earth itself. Suffering from Parkinson’s disease, he had not performed since the mid-90s, staying at his home in West Stockbridge, Massachusetts. While never much of a commercial success, he followed his own creative path over the course of a fifty year career. Happily for the world at large, the CD era has brought forth a worthy array of his recordings. His influence can also be heard in the music of players and composers who have followed in his wake, including much of the ECM label roster and Bill Frisell’s blend of jazz, folk and classical idioms. Maybe because of its human scale, I’ve always related Giuffre’s music to moments in my own life. On the day he died I was at a radio station in Milwaukee. Standing by their wall of jazz CDs, I wondered how in depth the collection was. I knelt down to check out the “G” area. Jimmy Giuffre? None. When two days later, I learned he had died, I immediately recalled that moment. I’m not assigning cosmic connectedness; given how often I think of the man’s music, it was bound to line up with outside events. Jimmy Giuffre is gone, but I can’t imagine not having his music in my life for the past 35 years. It even feels as if I’ve been listening to him as long as I’ve been alive.